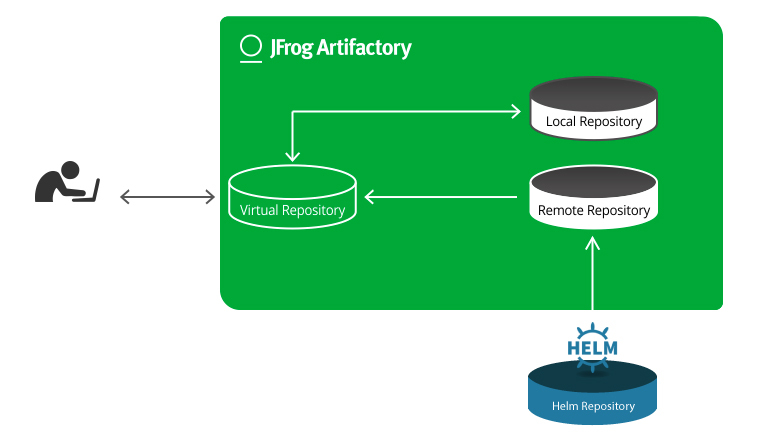 With the 5.8 version release, JFrog Artifactory now natively supports Helm Chart Repositories, giving you full control of your deployment process to Kubernetes – the leading open-source orchestration platform for automating deployment, scaling, and management of containerized applications. JFrog fully supports deploying Artifactory to your Kubernetes cluster to serve as a universal repository manager for all your CI/CD needs wherever they are running in your organization. Artifactory lets you host internal Helm Charts using local repositories. This means that you’re not dependent on the network performance between your datacenter and any external Helm repositories, such as the official public Helm repository. And your performance won’t be impacted due to changes for example in Chart dependencies. Artifactory’s virtual Helm chart repository aggregates your local and remote repositories into one, giving you the ability to resolve and install Charts from a single URL. The new Helm support offering continues to add to Artifactory’s universal binary management support, with all the benefits. Artifactory integrates with your existing ecosystem to support end-to-end binary management that overcomes the complexity of working with different software package managements systems, like Docker, NPM and Java, providing consistency to your CI/CD workflow. Secure your Helm Charts with fine-grained access control according to projects or development teams. Calculation of metadata for Helm Charts hosted in Artifactory local repositories. Access to remote Helm chart repositories, in particular the Helm stable public repository and Official incubator repository, through remote repositories which provide proxy and caching functionality. Letting your Docker client work transparently with multiple registries in Artifactory without a reverse proxy. Easily applying configuration changes using a YAML configuration file.